Do you know if there are any differences between the various editions of the (old-style) 6th expansion (Count, King & Robber) regarding the colour shades on the tiles? My copy has significantly darker colours, both the fields and the cities have much more saturation than the tiles of the basegame (and other big expansions). Do your Exp 6 tiles look like my original base game? Or are they more like the monasteries & cathedrals? Here is a collage of my base & expansion tile scans for reference. My Zman Count, King, and Robber matches my base game perfectly. My Bridges, Castles, and Bazaar's are a bit lighter. The Cult tiles from CKR are lighter than the ones that came in the Spielbox promo. All of the above are lighter than the German monasteries, so I have at least 4 shades of old art green. For whatever it's worth, I mentally separate my tiles into three printing variations of lightness/saturation, which for simplicity I call Medium, Light, and Dark. Things are probably more complex than that, really, since the "light" tiles seem to have more yellow in them. But anyway, below is how the printing history looks to me based on the tiles I've gathered between 2000/2001 and 2017. "Medium": In the early years, everything looked nice and consistent up through about 2004. "Dark": Then, for some inexplicable reason, tiles went dark again, and this time even darker than the original base game. There's a bit of overlap here in 2013/2014; I assume that is because things are not always released in the order they were printed, but there could be other reasons. Then there are the anachronisms: tiles whose coloration does not match the period of time in which they were released. I welcome all feedback and additions/corrections to this list. Here's a photo illustrating the colour difference. 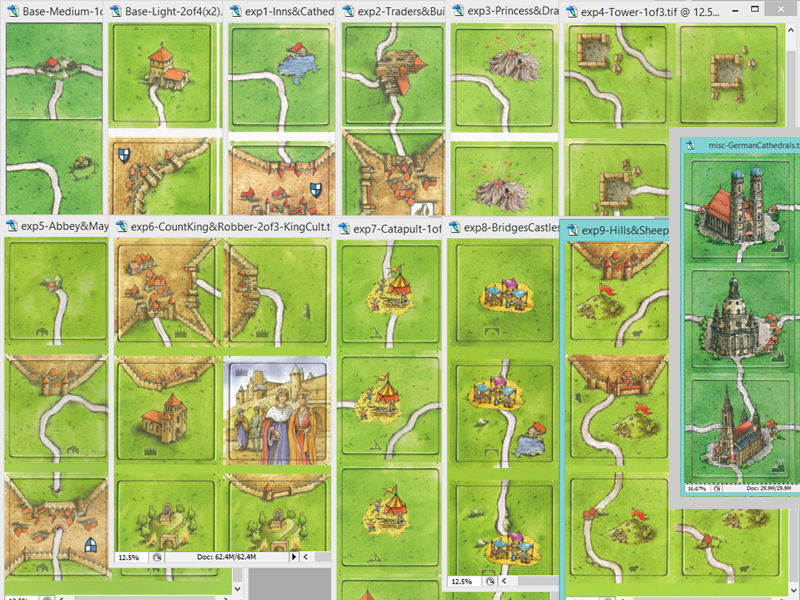 I hope it's apparent that the tiles from CK&R are darker and much more saturated. In my collection this is the only (old artwork) big expansion with remarkable colour issue, so that's why I thought that there might be other editions with proper colours. "Count, King & Robber" was the very first expansion I separately bought, and I was a bit surprised, and not very pleased, at first glance, that the tiles were much lighter then the ones, I owned before. 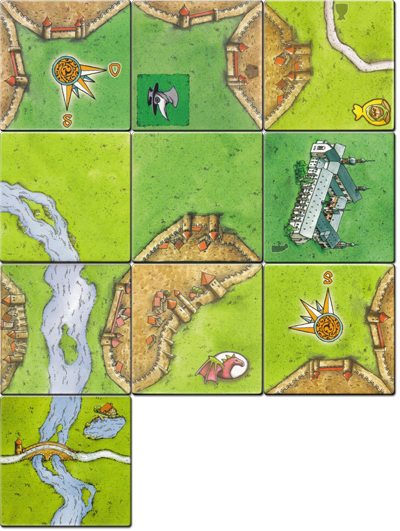 But that's because I started my Carcassonne with Big Box 5, which has a tone more suitable to the Plaque tiles (and probably depicted German Cathedrals?) then anything else. So I did not noticed CK&R to be significant darker then other expansion, but this might be also, because the Base Game (and I&C, T&B, Minis) will always stand out. I have the Wheel of Fortune and River III tiles from the Big Box 5, and they don't seem to be that dark. Hounk, may I ask you which edition of the 6th expansion do you own? When did you buy it? He meant Big Box 4. Do all tiles also exist in dark green?